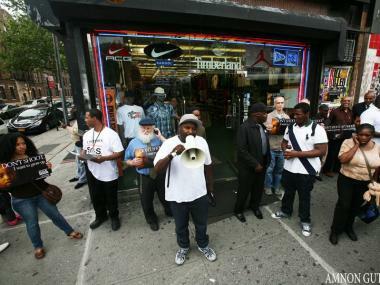 A community response by Save Our Streets Crown Heights after a young boy and a school teacher were shot inside a shoestore on Utica Avenue last month. CROWN HEIGHTS — They're not cops or firefighters, EMS or in public safety. But when a young boy and a school teacher were shot inside a shoe store on Utica Avenue last month, members of the Crown Heights Community Mediation Center were among the first responders. "We did a shooting response there because it was so close to our catchment area, and it was in the middle of our arts against violence week," said Amy Ellenbogen, project director at the center, which hosts the Save Our Streets anti-gun violence program. "We do them really quickly. That one we actually called two hours later." Though the center has been an integral part of neighborhood life since the 90s, SOS was formed just two years ago, in response to what many perceived to be an epidemic of shootings in the area. "We think about gun violence as a disease that spreads from person to person, and our efforts focus on those people who are the highest risk of being transmitters of gun violence," Ellenbogen said. "Every time there’s an incident of gun violence, within 72 hours we organize a response, and sometimes as many as 200 people come out to say this violence will not be tolerated anymore." In the years since its first march, the program has grown to encompass a public health-style poster campaign, much like those targeted at lifestyle diseases like obesity and smoking, as well as an ever-expanding calendar of community events. Last month, it was Arts to End Violence. This week, the group launched Kickoff to a Safe Summer, a jam-packed roster of anti-violence events. For Thursday's Brooklyn/Queens day, they're hosting a block party at Kingston Avenue and Park Place along Brower Park. The party will culminate in a March to End Gun Violence, beginning at 5 p.m. in the park. "We want to make sure that everyone in the neighborhood and beyond knows that there’s a role for them in ending gun violence," Ellenbogen said.